It's been a good week here at Go Stay Work Play Live World Headquarters, in a few different ways. First, I finally received the letter I need in order to apply for my Russian visa, which is a huge relief. This means that in a week or so I should have the necessary bit of paper pasted into my passport that will allow me to enter the country. Also, I've settled on a new study method for the Russian language business, which feels a bit more sustainable than what I've been doing up to now. Instead of spending hours staring at long lists of words or bashing thorough hundreds of flashcards in a day, none of which seem to stick for long, I've decided that every day I'm going to concentrate on just a few words each day. Two verbs, two prepositions, and four other words. Every day. So today, for instance, is brought to you by the verbs "to be" and "to live", the propositions "on" and "over", and the words north, south, east and west. The big thing, though, is that I've been able to get out of the city for a little break. "Break?! Break from what?" I hear you cry. "You've done nothing for weeks!" I have no good answer for this except that the waiting game was getting me down a bit, so I was casting about for a nice short trip I could take to pass the time and give me something interesting to blog about. I was thinking an overnight to Canterbury or Bath or similar, but a friend and neighbour from down the street offered a visit to his family's house in the Lake District, which was far too good to refuse. 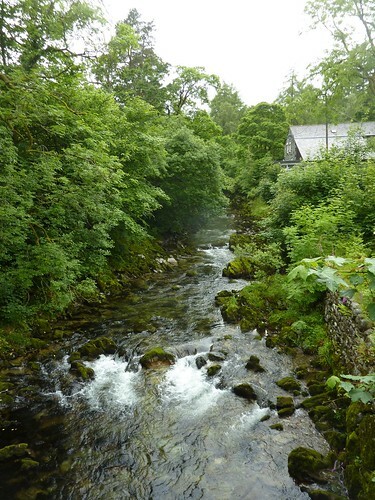 That's how I found myself sitting in a cozy kitchen in a big old stone house in a positively idyllic valley in the heart of the Lake District National Park. And though there was a predictable amount of rain that lasted for a mizzly couple of days, it was still great. Visiting someone else's family country home was a bit funny. It reminded me in many ways of family cottages and cabins at home: the slightly musty smell of an under-used building in a damp climate, the odds and ends of furniture and decor, and the shelves of books from another time. The difference here was the vintage. Where in Canada a lakeside home might, at a stretch, date back to the 1920s, the earliest parts of this house were built in the 17th century which means it was all heavy beams and thick stone walls and wide planked floors. Just excellent. See what I mean? Idyllic, I tell you. I always thought that the Lake District was somewhere in the middle of the island, which shows how appalling my sense of English geography is. (Never mind that I also thought Blackpool was somewhere just down the coast from Brighton.) In fact, the area is most of the way up the island on the left hand side. As my host pointed out it, it's quite bumpy, meaning that the chief recreational activity in the park is what's known as fellwalking. 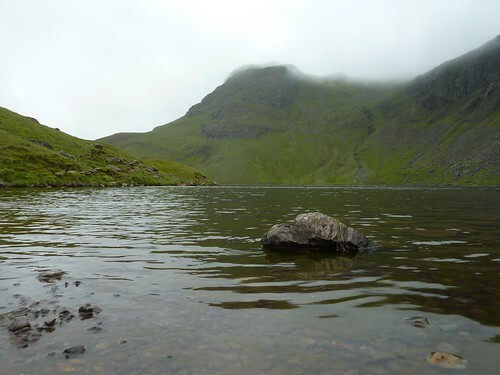 "Fell" is the local word for a mountain, and there's no shortage of them in the park, which is England's largest and includes its highest elevation, Scafell Pike. At 978m above sea level, Scafell is not exactly Everest territory, but this is not an island given to extremes of geography. You might not need oxygen tanks, but it's still a solid effort to get to the top of most fells. 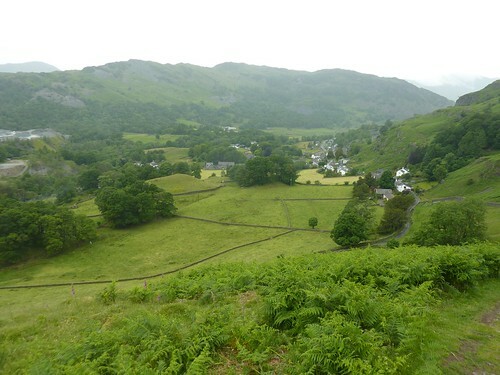 Fellwalking is the Lake District equivalent to the namby-pamby sort of countryside walking that I've been doing in the much flatter southwest and involves long walks up and down hills on paths ranging from friendly through challenging and on to downright nasty. There are also fellrunners, who take the already challenging business of fellwalking and push it to extremes by scampering up and down ankle/leg-breaking slopes at top speed. Now that I've experienced some reasonably steep and rocky inclines I can say with some authority that fellrunning is quite simply mad. A five hour walk on day two of my visit - in the rain, of course - took us about 9.5 miles as the crow flies but must have been at least a mile longer when the elevation was taken into account. The scenery really is magnificent, particularly when you get up high and find the small lakes known as "tarns", formed due to glaciation. A tarn in the distance. 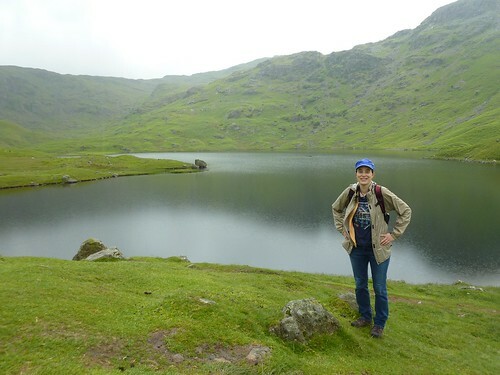 Me, at Easdale Tarn. And no, that's not a blue carrier bag on my head, it's an impulse-buy bright blue rain hat I bought in Grasmere which, though less than flattering, made life much more comfortable. 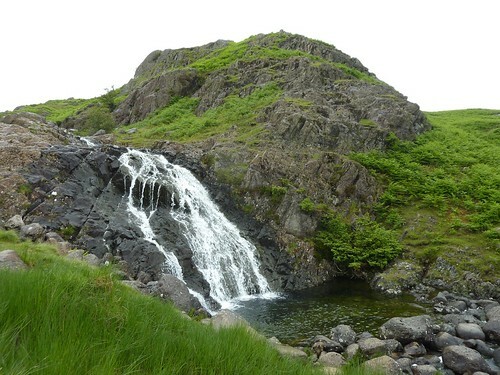 As far as I can tell, there is an abundance of three things in the Lake District. The first is hills, as I've mentioned. The second is sheep, who can be seen grazing on the aforementioned hills all over, making for bucolic scenes aplenty and tasty local lamb. 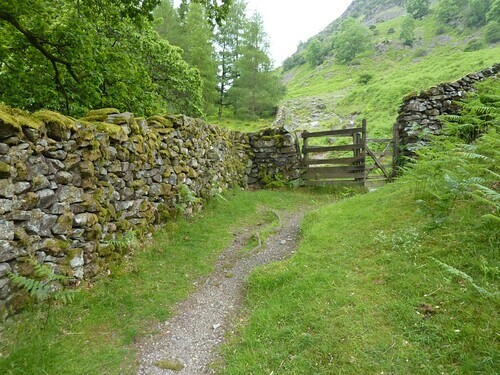 The third thing that fills the countryside is dry stone wall, which exists in such quantity (along with stone buildings) that its frankly astonishing. A rough wall, along with a few sheep for even more local colour. 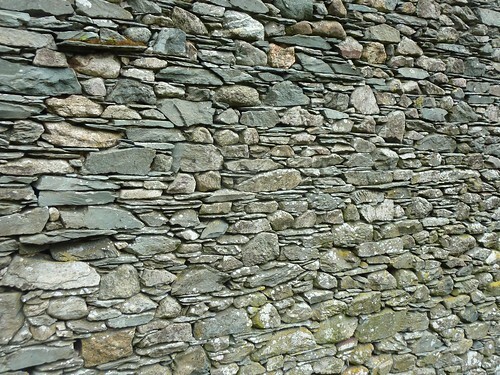 A dry stone wall is a lovely thing. It's constructed with no mortar at all - the weight of the stones and the skill of the craftsman in choosing the right stone for the right place holds everything together and keeps it together, if all goes well, for centuries. It's incredibly labour intensive, and takes a huge amount of stone. Apparently a master craftsman can build about 3 metres of wall in a day. (And lift 3 tons of stone in the process. Read about it here.) At that rate, a mile of wall would take one waller a year and a half, working seven days a week. Look at the amount of wall in just this postage stamp bit of the area. 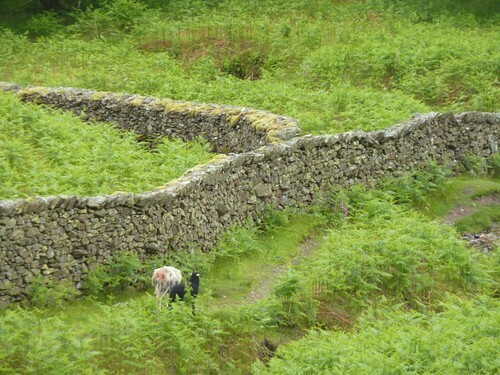 Apparently there are 180,000 miles of dry stone wall in the UK though sadly close to 90% of it is in too poor a condition to contain livestock, unlike most of the walls I saw in the Lake District. Luckily, stone - particularly slate - also exists in abundance in the lake country. There was even a working quarry on the other side of the valley from where I stayed that's been in operation long enough that it had big abandoned piles of scrap slate. 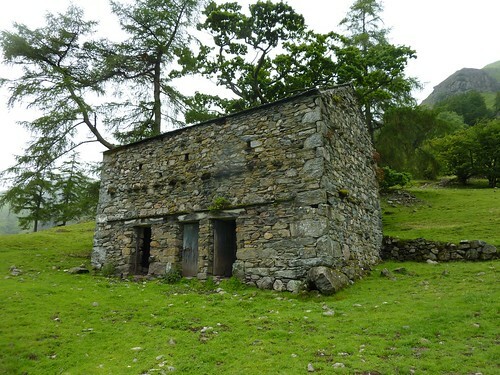 The buildings are also predominantly stone, and were even more impressive than the walls. And the side of this house. Fantastic. 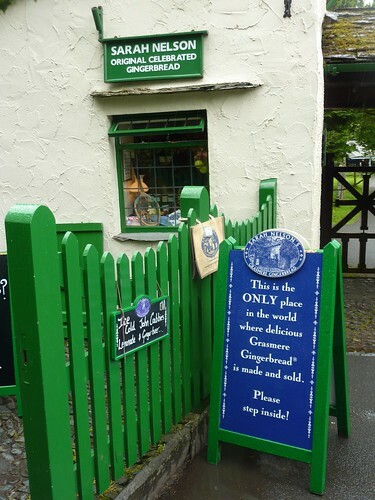 Besides tramping through a steady drizzle over hills, I also got to sample a few of the local delicacies including a particular type of gingerbread found only in the town of Grasmere. 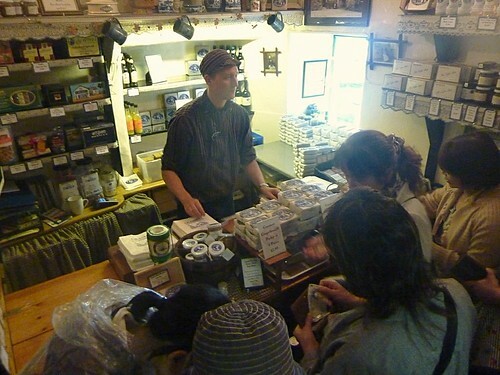 Grasmere gingerbread is a peculiar variant of the species that is only available from one tiny shop in the tiny town. Sarah Nelson's Original Celebrated Gingerbread Shop. This is the whole shop, filled with tourists. 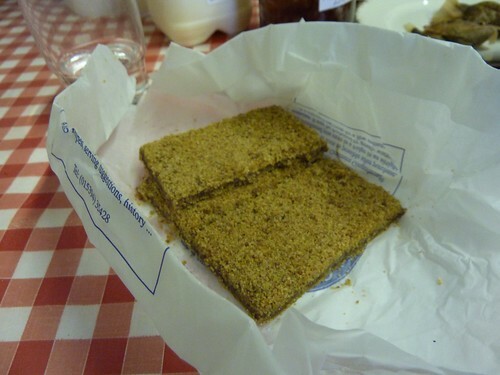 Grasmere Gingerbread is like a flat rectangular biscuit that comes in pairs. You can get it in packs of 6 or 12, wrapped in greaseproof paper or in a commemorative tin. I got some in paper, for immediate consumption a the top of the next hill, and some in a tin for safe transport back to London. cup of tea. Make some yourself. Besides the long walk there were other shorter walks most of which, miraculously, took in a nice pub or two along the way. This is one of the abiding pleasures of walking in this country: the place is built on such a human scale. I suppose it comes from having been so thoroughly inhabited for such a long time that the human-built bits are spaced apart in a human-scaled way. Towns and roads were established at a time when walking was the main mode of transport for most of the population, so market towns, pubs and other amenities pop up at commodious intervals. 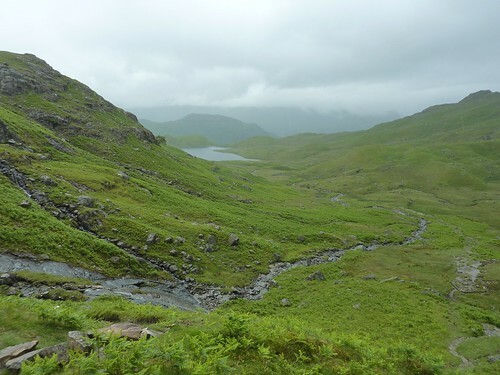 The pubs in particular are friendly to walkers and their muddy boots and drippy outerwear. It's all just, well, really nice. A scene from a short low level amble one evening that ended with a pint of something called Sneck Lifter and a few bags of pork scratchings. And now a few more gratuitous pictures of lake country, because I know I sound like a broken record, but it really was lovely. Dear Russian Language: Are you kidding me?! I apologise in advance for this post because I think it's going to get a bit dry and a bit ranty. If you've been paying attention at all, you know a few things about my life right now. I am about to move to Russia for eight or nine months to work on the Winter Olympic Ceremonies. I don't know WHEN I'm actually going, because my visa is delayed, even though my contract started last week. In the mean time, I'm trying to learn to speak, read and write Russian. Those are the overriding facts of my life right now. Or, to put things a bit more poetically, I spend my days waiting, translating and conjugating. It turns out that Russian is a surprisingly complex language. So complex, in fact, that if I'd had an inkling of its depths before I started I would almost certainly have decided to learn how to play the contrabassoon, or perform keyhole surgery, or solve quadratic equations in my head. Instead, I feel like I'm far enough down the road that I might as well keep going (some would call this the "sunk cost fallacy"). So because it's a big part of my life right now this week's blog is going to be about what makes Russian so difficult, which might exorcise a few demons for me, and be vaguely diverting for you. Or not. You may want to turn back now. Russian is written in the Cyrillic alphabet, which, as you can see, is the one with the backwards Rs and Ns. Before you can even get out of the starting gate, you have to learn your ABVs. (As I've mentioned before, not only do the letters look different, they go in a different order.) Some of the letters in Cyrillic are exactly the same as in the Roman alphabet (A, K, M, O, and T) which makes them pretty easy. There are also letters that look different, but make familiar sounds: Б, Г, Д, З, Л, П, Ф and Э (B, G, D, Z, L, P, У, F and E). They're not so hard either. Then there are letters that either look weird, or make sounds we don't have in English (or don't have a single letter for) or both: Е, Ё, Ц, Ш, Щ, Х, Ы, Ж, Я, Ч, Ю. They're kind of fun and easy because there are no pre-existing notions about what the symbol for "ts" or "sh" or "ch" should be, so it's easy to associate the new sound with the new symbol. (That last one - Ю ("yoo") - is my favourite letter, because I think it looks like the Starship Enterprise.) Lastly, there are the really devious letters, the ones that look like Roman letters but make a different sound. The worst offender is B, which makes the sound of V, closely followed by P which makes the sound of R , and H which is N. It seems to be almost impossible to overwrite four decades of imprinting with these letters. Forcing my brain to think "V" when it sees B is frankly exhausting. And there's the backwards N, which sounds like "ee". I'm forever writing N instead of И, making my long-suffering Russian teacher Michael repeat over and over, "But this is not Russian." Once you've (mostly) cleared the hurdle of the alphabet the next is not unfamiliar, at least to me. Russian is a gendered language, meaning that all nouns are either masculine, feminine or neuter. Even Michael, who speaks at least four languages and is a certified translator, cannot explain what possible reason there might be for assigning a gender to things that manifestly do not have a gender, like tables and shirts and drinking glasses. I find it arbitrary and pointless and if I ruled the world I'd abolish gendered nouns in all languages tomorrow. If there are any linguists out there who can explain what purpose this serves, or how it came about, I'd appreciate it. In French, genders modify the articles or pronouns used with the noun. It's ma mère, mon père. Le chien, la chat. 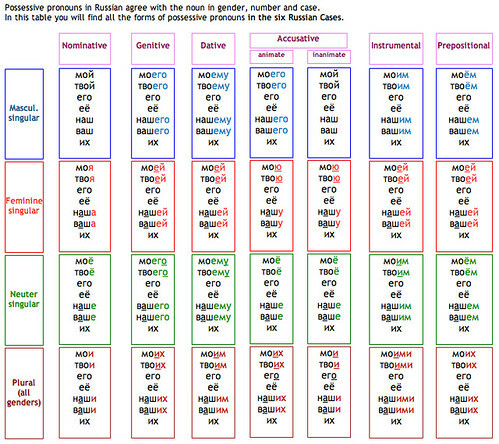 In Russian the gender doesn't just modify the pronoun, it also changes any adjectives associated with the word. In English this would be like saying "my red ball" (masculine singular) or "my-la red-loo bat" (where both "my" and "red" are modified to match the noun). Fun times. And, just to spice things up, the modification changes depending on the letters at the end of the noun in question and whether it's singular or plural. So it's not simply a matter of memorising that you add a "la" to adjectives when the noun is feminine. Oh no. There are charts. Moving right along... There's another concept in Russian that I'm finding very hard to grasp: perfective and imperfective verbs. Russian verbs come in pairs. In English we will use a single verb to denote all forms of an action, such as: I am writing a letter. He wrote a book. They write weekly newspaper articles. I will have written the list. She was writing to her grandmother. These all use the verb "to write". In Russian, they use an imperfective verb for actions that are ongoing, or regular, or incomplete (I am writing a letter. They write weekly newspaper articles. She was writing to her grandmother.). For actions that are successfully completed, they use the perfective form. (He wrote a book. I will have written the list.) The perfective form is a different word. Often the perfective form of a verb is based on the imperfective, with a prefix added (видеть "VEE-dets" and увидеть, "OOveedets", both of which mean "to see"). Sometimes they are completely different (говорить "gahvahREETs" and сказать "skahZAHTs". The imperfective and perfective forms of "to speak"). For instance, if you say "He took a test" using the imperfective form, it means either he didn't finish taking the test, or he took it and failed, or we don't know if he passed or failed. If you use the perfective form, then you know he completed the test AND he passed. It's interesting if you are, perhaps, reading a blog post about Russian on your coffee break. It's maddening if you're actually trying to become vaguely functional in the language. Verbs of motion are even trickier. For instance, there is no Russian verb "to go". Nope. In Russian you can go by foot, or you can go by transport, but you can't just go. Also, if you're going by foot, you need to know whether you're just walking around, or regularly walking to and from somewhere (imperfective form), or whether you walked a specific place and now you're done (perfective form). Oh, and if you're just starting out you use a different verb than if you're in the middle of your journey, sort of like the difference between "I'm heading off now." and "I'm half way there." It's the same with running. For instance, this afternoon I'll go for a run around the neighbourhood, which is something I do regulary. The verb for this is "BAYgal". If, while I'm out there, I get chased by a dog and have to run away, the verb changes to "BAYzhal". Here's what this means to the poor scholar of Russian. 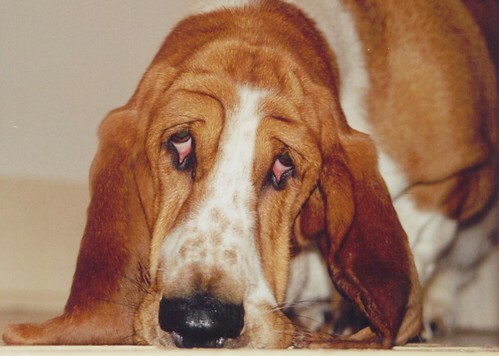 Look at this sentence: "I love dogs with long ears and sad faces." Here, the subject is "I" and the case is determined by the preposition "with", which takes the instrumental case. So in order to translate this sentence I need to know how to conjugate the verb to love, and then know the preposition "with" and the word for dogs (which is feminine and plural). 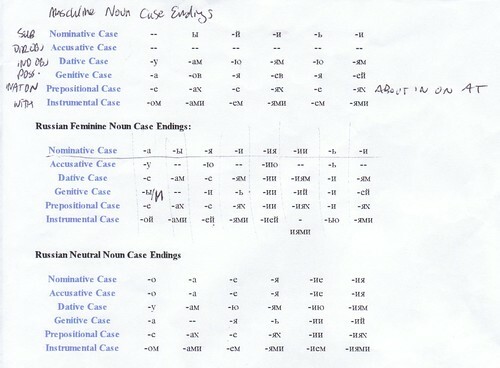 Then the noun "ears" (neuter, plural) which gets modified for the instrumental case, and the adjective "long", which gets modified to its instrumental, feminine, plural form. And the same again for "faces" and "sad". To do this correctly, I consult a list of vocabulary for the nominative forms of dog, ear and face and the masculine singular forms of long and sad. Then I check the case that's indicated by "with" (instrumental) and then check the chart that shows me what case ending I add to "ears" to indicate plural and instrumental. Then it's over to another chart to modify the adjective "long" to match with feminine instrumental and plural. It is simply exhausting and disheartening. It takes me about four different charts and ten minutes to construct a sentence, and then it's almost always wrong in some way. What's not to love? я люблю собаки c длинными ушами и грустными лицами. The consequence of all this complication is that it's tricky to speak Russian properly, but when you do, it's very precise and uses fewer words. Michael, the aforementioned long suffering Russian teacher, explained cases like this: imagine that words are bricks. English bricks are all shaped the same way. You can mash one brick up against another brick with impunity. Each brick is modified to fit with its neighbour. So it's trickier to construct a sentence, but if you do it right, it's stronger, more precise, and takes fewer words. (There are no articles in Russian at all!). Interestingly, English once used cases and still retains some vestiges of that today. When we say "He threw the ball to ME" instead of "He threw the ball to I", that's the last gasp of the now-almost-dead genitive form. We use "me, him, her, us, and them" instead of "I, he, she, we, they". And hence the title of this post because seriously, are you kidding me?? As you can see, if I want to say "My uncles went to Moscow." I first have to know the case that goes with "uncles" (nominative, mercifully). Then I need to realise that uncles is masculine, animate and plural, then I can see that the correct pronoun is моих. If I want to say, "The spoon is on our table" then table should be in the prepositional case as determined by "on" and it's masculine and singular and inanimate so the form of "our" is моём. Perhaps now you can understand why I'm not brimming with confidence about my ability to be chatting merrily in Russian in the foreseeable future, or even, in fact, in my lifetime. Of course native speakers don't wander around with a fistful of index cards that they consult before they open their mouths. Just like with any language, you absorb the intricacies from birth and have them further refined and spelled out to you at school. For someone coming to the language as an outsider - especially an outsider who's never encountered the notion of cases - it feels like a monumental and frankly hopeless peak to scale. And I have to admit that, as a native speaker of a language with no cases that still seems to function perfectly well, thank you very much, I have a lot of trouble understanding what this level of complexity adds to a language. Yes, Russian has Pushkin and Tolstoy and Dostoyevsky. But English has Shakespeare and Dickens and Jane Austen and, well, I could go on indefinitely. The point is that they all managed to be brilliant and expressive and eloquent while scraping along with just the nominative case. All of which leaves me wondering if there's any point in continuing to bash my head against this wall. Then again, what else am I going to do with my time? Perhaps I should fire up eBay and see how much they're asking for a used contrabassoon. The clock is ticking on my time in London, though I'm dismayed to report that I still have no visa for Russia. Or, as we say, "Y меня нет виза". No visa means no plane ticket, hence no departure date, hence I continue to waffle around in a sort limbo which is not really unpleasant, just slightly tiresome. However, after a cool grey sort of week, it looks like the weather is warming, and since my entire existence seems to be about words words words words words these days, I decided to have a bash at a few more particularly English words and phrases while I'm still still actually surrounded by the language. Today, we're looking at words that are sort of summery. Bank Holiday = Statutory Holiday, public holiday. Of course these don't just happen in summer, but year round. Interestingly, there is not automatic right to a day off on a Bank Holiday, but in practice most people get the day off, or get extra pay for working on a Bank Holiday. And yes, the banks do close. The Bank Holidays in England and Wales are: New Year's Day, Good Friday, Easter Monday, May Day (the first Monday in May), the Spring Bank Holiday (original name that one, it's on the last Monday in May), the Summer Bank Holiday (last Monday in August, with the Her Majesty's Loyal Guild of Bank Holiday Namers again doing overtime on that one...), Christmas Day and Boxing Day. In Scotland they get an extra day at New Year, and St. Andrews Day. In Northern Ireland they get St. Patrick's Day and July 12th (for the Battle of the Boyne). Bank Holiday Weekend = Long Weekend. As in Canada, a long weekend is a cause for celebration, an excuse for a short trip, and a reason to fire up the BBQ. In England it's also a virtual guarantee of miserable weather. The basic assumption is that it will rain on a Bank Holiday, especially one in the summer, but this gives people a chance to moan a bit which is, of course, the national sport (after queuing). And a slight aside: You don't do things ON the WEEKend. You do them AT the weekEND. Different preposition, and the stress goes on the second syllable. Mac (Mackintosh) = Rain coat. Since it will certainly rain on your Bank Holiday Weekend, you'd be well-advised to have a mac on hand. Mac is short for Mackintosh, the trade name for the original rubberised canvas waterproof coat invented by (please try to hide your surprise) one Charles Macintosh (the K got added later) (And not this Charles Mackintosh). Now it's a generic term for a waterproof coat. The other generic term for this would be waterproof. As in, "Avery packed his waterproof for the trip across Dartmoor." If you've got waterproofS (plural) then you're probably packing a mackintosh and waterproof trousers. Pack a Mac = If you're short on space you might consider investing in a pack-a-mac, that lightweight sort of waterproof jacket that folds up into its own pouch. Wellies = Rubber Boots. If its going to get wet, you must have wellies. Short for Wellingtons, and named after the famous Duke, who originated the style of footwear. Though it's important to note that the original Wellington boots were short leather affairs, not the all-rubber ones we're used to today. (One can't help but think the good Duke would have cut a slightly less dashing figure if caught sloping around the battlefield in gumboots...) Here they are usually a greenish colour and often have an extraneous strappy buckle thing on the side that's obviously a vestige of something that was once useful, like the welly equivalent of an appendix. In North America, of course, we favour the traditional black-and-orange. 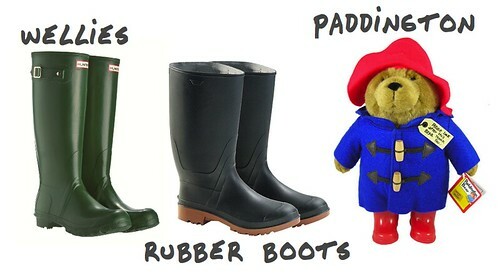 Besides the eponymous Duke, another celebrity who's often portrayed in wellies is Paddington Bear. Caravan = Trailer. Once you've packed your wellies, your mac, and possibly your Paddington Bear, where exactly might you go on a Bank Holiday Weekend? Well, you might hook up your caravan and head out onto the open road. 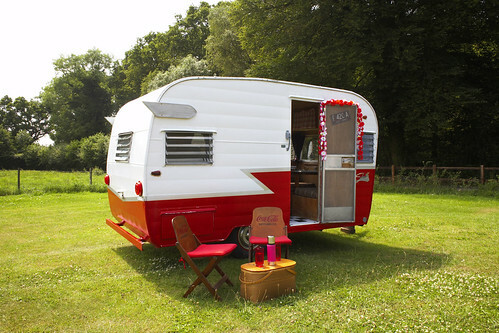 As in North America, its a popular pastime to go caravanning. Or, you might own a caravan that stays parked in a serviced caravan park. It's a bit like having a cottage without having to build the cottage. You're not fooling anyone with you're "I'm in control here" expressions. We know the truth. Bangers = sausages. If you've gone to all the trouble of getting out in your caravan (and if you've got an umbrella big enough) you'll probably want to fire up the BBQ and throw on some bangers, another word for sausages. 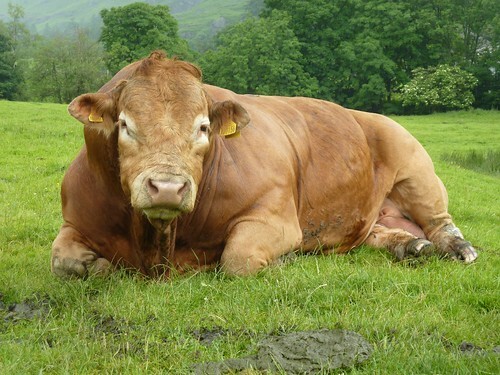 While the BSE crisis of a few years back resulted in a general upgrade to the quality of meat in British sausages, the term "banger" is still unregulated, meaning that while foodstuff labelled "pork sausage" must, by law, contain at least 42% actual piginess, a "banger" could have all kinds of nasty things in it, including, but not limited to, connective tissue, meat slurry and, quite possibly, recycled wellies. The term "banger" originates in the early 20th century, probably as a result of the fact that skins of low-quality sausage-like things with high water content tended to burst open with a bang when cooked. I'd also be remiss if I didn't mention bangers and mash, one of the iconic dishes of the land, which consist of sausages and mashed potatoes, usually served with gravy. Lovely. Sausage Dog = Wiener Dog, or Daschund. 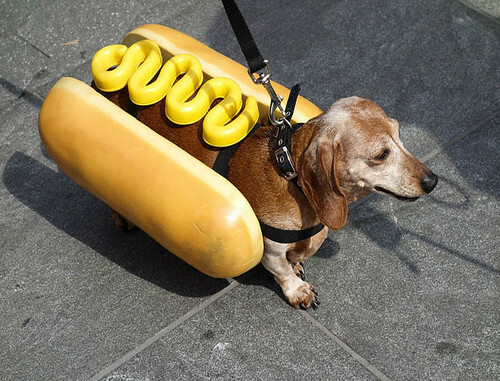 Because really, what's the point in having your own blog is you can't post a gratuitous picture of a daschund dressed up like a hotdog? Brown Sauce = HP Sauce. A popular accompaniment to bangers. Also very good on bacon rolls. As distinct from red sauce, which is sometimes a term for ketchup (which is also commonly called tomato ketchup), brown sauce is, well, brown. Not red. It's basically ketchup with Worchstershire sauce in it, and maybe a few other things for good measure - anchovy, tamarind, molasses, whatever. The best known brand of brown sauce is HP sauce, which has the distinctive label showing the Houses of Parliament, since that's where it got its name. The originator, Frederick Gratin, heard that his product was being served in the restaurant of the House and registered the name in 1895. 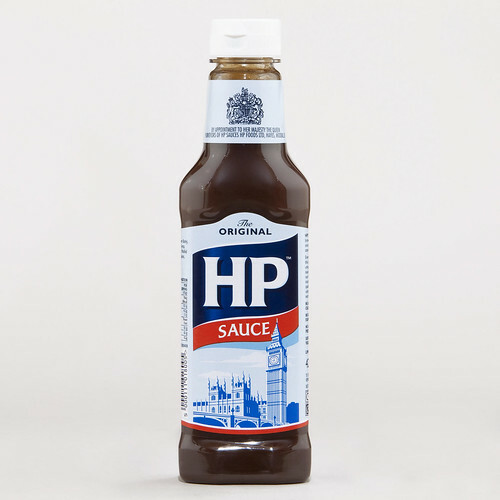 HP is by far the most popular brand of brown sauce in the country (and, one therefore presumes, in the universe). Jacket potato = baked potato. Alongside your bangers, you might decide to throw some potatoes on the BBQ and cook them whole in their skins. In this case, you'd be making jacket potatoes. Or, potatoes that still have their jackets on. The jacket potato is a common fast food and is normally served with a much wider choice of toppings than the traditional butter-sour cream-chive combo that's normal in North America. Standard fillings are: grated cheese, baked beans, tuna mayonnaise, and chill. They're a nice quick lunch, since once they're slathered in toppings, they're quite filling. 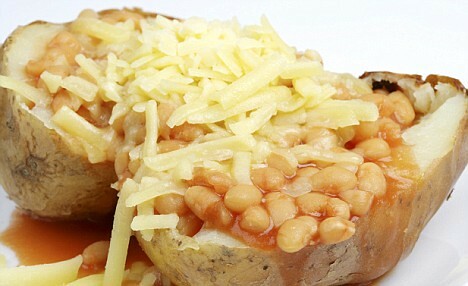 A popular topping combo of baked beans and grated cheese. See? Flaky. Though in truth, a more appropriate name would be Cadbury's Fold. 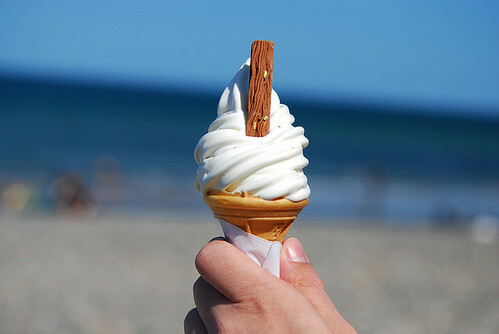 A Flake 99, or 99 Flake, or just a 99, is a soft serve ice cream, normally vanilla, served in a pointy cone and into which a half-sized Flake bar is inserted at a jaunty angle. They're a standard offering in ice cream vans all over the country. You can also get a variation with TWO Flakes, which is apparently sometimes called Bunny Ears. You'll almost certainly encounter an ice cream wagon selling Flake 99s at your local fête. 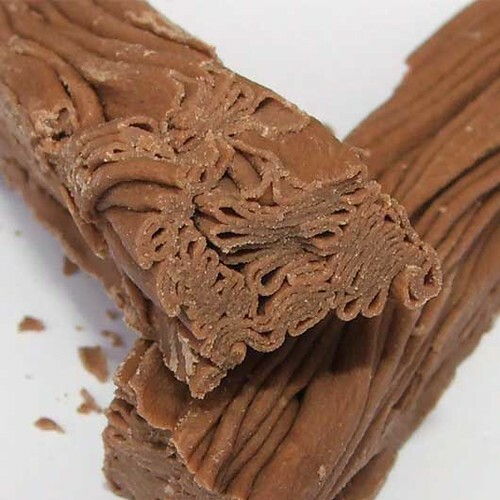 Flake 99, though the Flake in this specimen is not displaying the characteristic jaunty angle usually seen. Fête (pronounced FATE) = Fair. 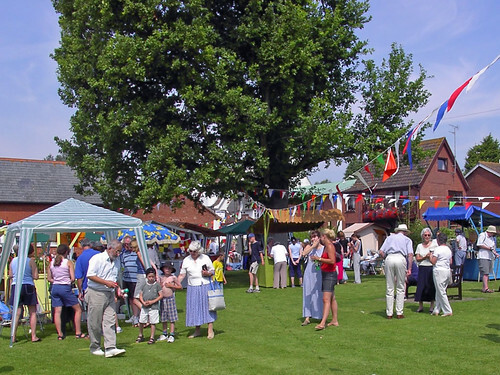 The Village Fête is an English institution that usually involves such classics as bunting, raffles (often called a tombola), baking competitions, white elephant stalls, home produce like jams and pickles, and poorly equalised sound systems. Fête-goers may also be subjected to Maypole dancing or, in extreme cases, Morris Dancing (which is definitely another post…). A fête is the equivalent of a summer fair in Canada, though the term is usually used for smaller events held in villages or neighbourhoods, not really the bigger events that have big mechanical fairground rides and such, like Dodge' Ems. 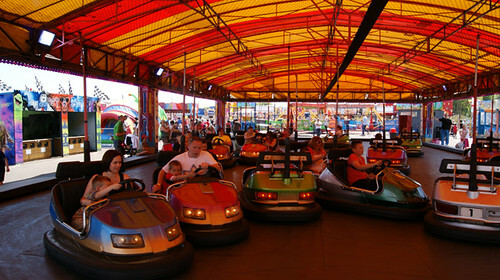 Dodgem = Bumper Cars. Another trade name (think "dodge them') that's passed into the vernacular, though this one is a bit silly because everyone knows that the whole point is to ram into the other cars as hard as possible, not to dodge them. Though the Elfin Safety Brigade occasionally trot out the notion that name dodgem indicates that the fun comes from the dodging, which is clearly crap. If you're meant to be dodging, why do they have enormous puffy bumpers? Marquee = Big tent, especially one erected for a fête or other special occasion. 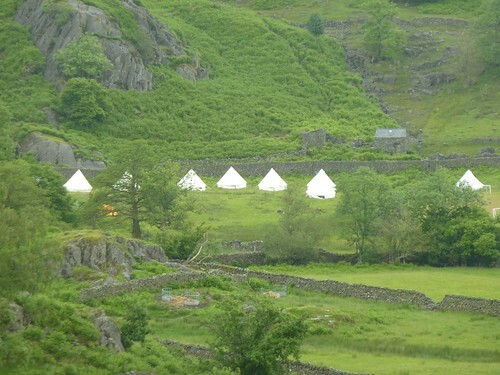 A marquee is a crucial element of any English summertime event because of the virtual guarantee of rain at any moment. Having a decent marquee means you can seek shelter for long intervals when you can carefully examine the fête display of prize-winning runner beans, enter the tombola, re-examine the runner beans, contemplate having a cup of substandard tea, strike up a conversation with a neighbour about the fascinating world of runner beans, and then lose all hope and make a dash through the rain to the local pub. Life has fallen into a sort of pattern in the last week or two. I get up in the morning and have breakfast, and then sit for an hour or two staring at lists of Russian verbs, or trying to remember how to say "It's getting late, I must go home." (For the record: становиться поздно. Мне пара домой. Of course.) Then I take a break, and have a run, or something to eat, or do a few errands, and then I decamp to a nice café for a brisk session of conjugating verbs and so on. And can I just say how much I appreciate the alternate keyboards that are available on iDevices? I've had the Russian keyboard set up on my phone and iPad for a while now and it's great. See? And the best part is, I actually kind of know my way around that mess now. This leaves a decent amount of time for doing blogworthy things, and I took advantage of that on Wednesday with a trip out to Woolwich, in the Far East, to check out two things that have been on my list for a while: the Woolwich Ferry and the Woolwich Foot Tunnel. The weather has finally turned nice here, so I've been cycling a lot, and I figured that the ride out to Woolwich would be a nice one, and not much further than my regular ride out to Blackheath which can be accomplished in a pleasant 45 minutes. In reality, Woolwich turns out to be quite a bit further than Blackheath, and much of the ride was on rather busy roads past grim industrial estates with me regularly checking my progress on my phone only to find I'd covered a dishearteningly short distance since the last check. Nevertheless, I eventually arrived with a plan to walk across the river through the tunnel, return on the ferry, and then escape for a cup of coffee in a nice café somewhere, since sitting in nice cafés occupies about 73% of my waking time right now. Instead, I wandered around fruitlessly behind a hideous leisure centre bouncing back and forth between a sign pointing west saying "Foot Tunnel Entrance" and a sign pointing east saying "Tunnel Entrance" with very little evidence of a tunnel entrance of any kind in the intervening space. I almost gave up until I finally followed the east-pointing sign along a series of bright blue plywood barriers, beside a chunk of Herris fencing, and towards an extremely nondescript and well hidden set of concrete steps and down to... Voila! Is this where you would have looked for the entrance to a turn of the century pedestrian foot crossing? Or is this perhaps where you might look if you wanted to discard an old sofa and not pay the tipping fees? It turns out the entire lovely round brick edifice is positively festooned with scaffolding and barriers, making it mostly invisible. It may as well have been "stuck behind a disused lavatory with a sign on the door saying 'Beware the Leopard.'" 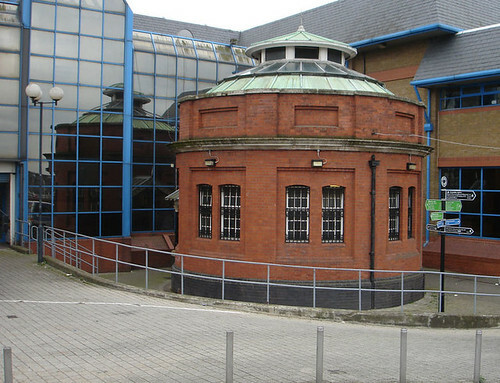 The Woolwich Foot Tunnel was constructed to allow workers from the docks on the north side of the river access to the pleasant residential areas on the south, and it still serves essentially the same purpose. At one time there were apparently quite lovely wood panelled elevators at either end, but those have long since been taken out of service. In fact, the tunnel has undergone some major renovation in the last few years, which, judging by the state of the entrance rotunda, are still underway. I think most of the money has been spent on safety issues like, for instance, ensuring the Thames doesn't flow impertinently into the tunnel at inconvenient moments. In this respect, the renovations have been a success, because I was able to traverse the whole length of the tunnel without getting my feet wet. The entrance stairs are wide and wrap around for about a hundred and thirty steps. Also pictured, the disused lift entrance. The tunnel slopes up slightly at either end, so you can't see the ends from the middle. Like I said, a bit disquieting. I strolled the whole length and it was largely uneventful. I met one or two people coming the other way, but mostly it was just a long cool walk past half a kilometre of glossy white tile. Then again, I'm not sure I'd want it to be part of my regular commute. It's just a bit too... inescapable. Nevertheless, I emerged unscathed on the north bank through another scaffold-bedecked rotunda and made my way over to the dock for the Woolwich Ferry, my ticket back to the sunny south. The Woolwich Ferry began operation in 1889, though there's been a ferry crossing at more or less the same spot since about the 14th century. The army established its own ferry in 1810 to service the Woolwich Arsenal, and various other companies have run ferries as well. The current service was established by the Metropolitan Board of Works, which had taken over operation of toll bridges in West London and removed the tolls. The ferry was also free when established and still is today, for both foot and vehicle traffic. It provides a useful alternative the nearby Blackwall Tunnel (Maurice Fitzmaurice, of course! 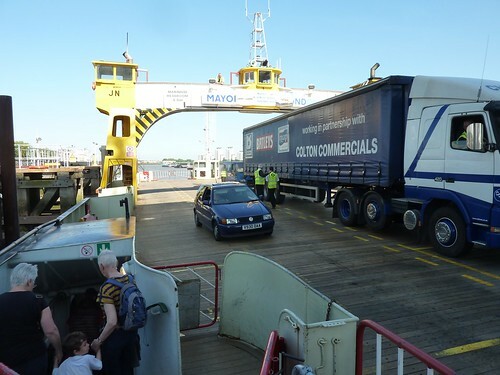 ), but sometimes the queue for the ferry backs up far enough that it's quicker to make for the tunnel. The nearest downstream crossing is at Dartford, and includes the easternmost bridge across the Thames. Vehicles and foot passengers boarding the ferry on the north side. It's a funny old thing, the Woolwich Ferry. Very utilitarian. Two vessels operate at a time (though there are three in the fleet) and they basically spend their whole working day switching places. One boards vehicles and passengers on the south and chugs over to the north, while the other starts on the north and goes south, covering a mere 400 metres each way. Then they switch places again, doing so about every fifteen minutes. I can't help but think its not the most glamorous maritime career available. It must be the nautical equivalent of driving an airport shuttle bus between terminals. The Ernest Bevin, chugging away. 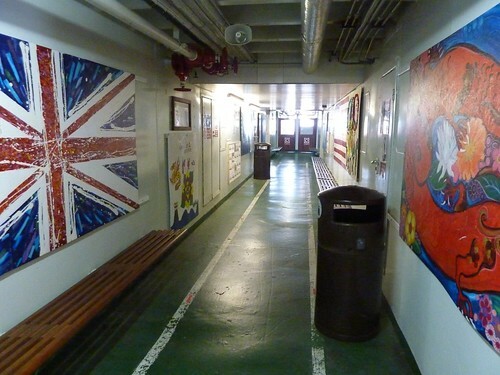 The foot passenger area is below decks and ridiculously vast for the number of people it serves. 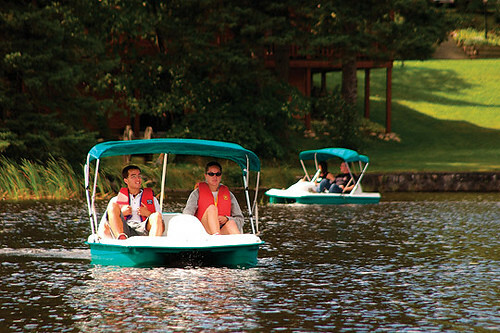 The licensed capacity of the boat is 500 foot passengers; on the day I traveled I was accompanied by six other people. This left lots of room to wander around and take pictures of the decidedly basic but still somehow charming decor. In contrast with the crossing via tunnel, a ride on the Woolwich Ferry on a sunny afternoon is a lovely and life-affirming thing. You get a nice view of the Thames Barrier, with Canary Wharf and The Shard behind it. And it's breezy and warm and thoroughly enjoyable, as you can see by my thoroughly contented expression here. Me, with the north ferry terminal in the background and a blue sky above. Once I'd disembarked and found my bike again I pedalled off to Blackheath, which again turned out to be further and sweatier than I was expecting. You may recall that I'd planned to find a nice café to sit in, but it quickly became clear that was simply not going to be sufficient. Really, there was only one reasonable choice. And so life continues, in a sort of odd, anticipatory, suspended kind of way. I'm still waiting for the paperwork I need in order to apply for my Russian visa, which leaves me wondering whether I should be packing, or sitting tight, or searching for short term work or what. Theoretically I should be on a plane to Moscow in, er, six days. I reality, I have to think that schedule is becoming more and more unlikely. I which case, I guess I just continue my quest to remember the genitive, dative and accusative form of вы and my search for the for perfect flat white coffee and keep my fingers crossed. All I can say is... stay tuned. Enough of these endless museums and sights and such - time for some more food! This week it's pork pie, a traditional English food especially popular at picnics or as a snack. Unlike other meat pies, pork pie is always served cold. Pork pies are also among the densest substances in the universe, falling somewhere between lead and black holes. This means they're quite sturdy, which, coupled with the fact that they don't need heating, makes them excellent for picnics. Traditional pork pies are made with hot water crust pastry and a filling of pork and savoury jelly (I know, I know... meat jelly... but really, it's ok). I briefly contemplated baking a pork pie for the blog but honestly, I've got way better things to do. As the name suggests, hot water crust pastry is made by adding the fat to hot water, then mixing in the flour. This makes a sticky paste that's ideal for hand-raising, the traditional method for shaping hot water crust pastry. The pastry gets shaped into an open barrel sort of shape, with the raw wet filling added and the top put on, with it's distinctive raised rim. You can also mould the pastry with a pie dolly, which is kind of cheating. After filling and adding the top you're supposed to let the pie sit overnight before baking. Then when the pie is baked you cool it, make a hole in the top, and pour in warm meat jelly that fills up the space created when the filling shrinks in cooking. Then you cool the whole thing again in the fridge for a day before eating. So really, even though I'm mostly unemployed, I still have better things to do than spend three days making a freakin' pork pie when you can walk into almost any shop and get one for about £1.99. A selection of pork pies from Marks & Spencer, including a couple very cute tiny two-bite pork pies. Total cost: £4.49. 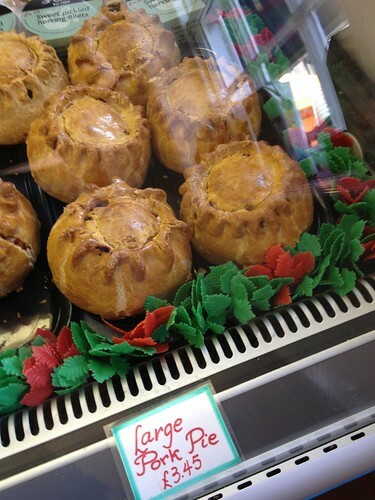 Pork pies are usually quite small - the large one here is only about 4 inches across. I think this is because of the aforementioned denseness, meaning that a pork pie similar in size to, say, an individual steak and ale pie, would probably feed twice as many people. Or it could be used with deadly force if flung at an intruder. Try and do THAT with a namby-pamby chicken and leek pie! Pork pies are synonymous with the Leicestershire town of Melton Mowbray (which sounds like some kind of spring weather phenomenon, as in: "Farmers should prepare for flooding because there's a strong chance of a powerful melton mowbray in the forecast."). In fact, Melton Mowbray pork pies have protected designation of origin status, (like Cornish pasties) meaning that a maker can only claim to produce a true Melton Mowbray pork pie if it conforms to certain standards such as being made, unsurprisingly, in or near Melton Mowbray. 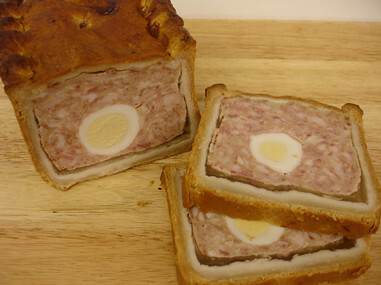 Another important features of the Melton Mowbray pork pie is that the filling is made of chopped, uncured pork, which gives the cooked filling a sort of grey colour (as opposed to the minced, cured pork used in a common or garden pork pie which is quite pink, like ham or bacon). 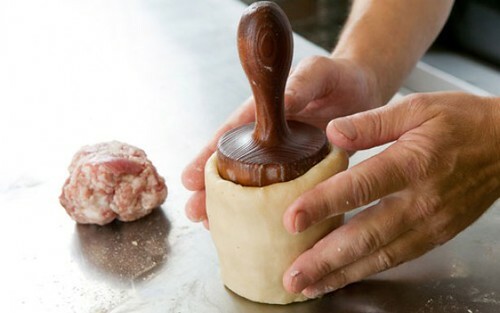 And a Melton Mowbray pork pie will always be handmade - no moulds or pie dollies allowed. This means they're shaped somewhat irregularly and have a sort of slumped appearance. Melton Mowbray pork pie, exhibiting the greyness, coarse texture and slumped shape that shows its the real deal. Though don't those seem like sort of sad things to strive for? I can just picture the poor apprentice pork pie maker in Melton Mowbray being dressed down by his master, "Son you'll never get anywhere in this business until you make that filling MORE GREY! And couldn't you make the whole thing a bit less tidy?" 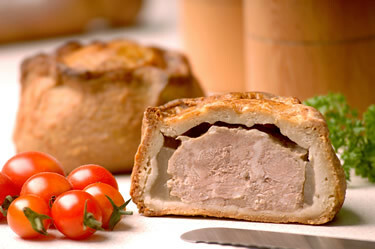 While plain pork pies are quite common, there are some specialty varieties that crop up, chief among which is the gala pie. It's a larger variety with whole hard boiled eggs in it, and is usually baked in a loaf tin, so it's rectangular and gets served in slices. When done properly, each cut has a nice slice of egg in it. To accomplish this, sometimes the baker will prepare a "long egg", which involves separating eggs and cooling the yolks separately in a long mould, then adding them to the whites in a larger mould and cooking again, and then adding the resulting long egg into the pie. (And you thought making a plain pork pie was a pain...). Still, it's pretty, as pies go. 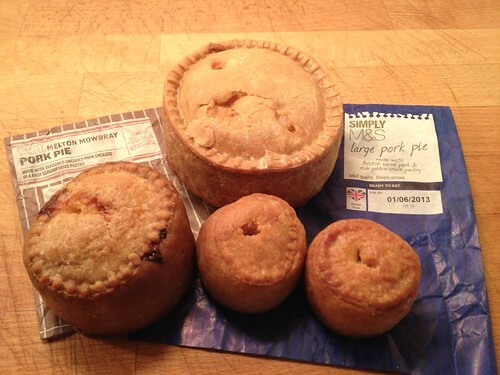 As you can tell from the picture above, I invested in a variety of pork pies for this blog. Having tasted both the common and Melton Mowbray varieties, I can honestly say I can't really tell the difference. Perhaps I should have invested in higher quality pies. Perhaps if I had any kind of commitment to this blog and to you loyal readers I would have gone to Melton Mowbray and spent the week sampling the pies there. All I can say is that if you blindfolded me and held a gun to my head I would not be able to tell one from the other, though they were both quite pleasant, especially since I let them sit out for a bit and come up to room temperature, which I think improves the flavour, though I'm sure pork pie purists would be aghast. As for bite-sized pies, I say the larger the pie the better. The tiny ones, while cute, have an unappealing ratio of crust to filling, whereas the large ones can be sliced and last for several days, which also provides a good upper body workout moving them to and from the fridge. This is good, because a mere 100 grams (about one third of the larger pie pictured) packs in 425 calories and 32 grams of fat. Rio might be cool, but when I think about what was involved in this experience, and I think about trying to do that in a foreign country, in another language, far far away from either Canada or the UK... it just doesn't have the same appeal. Well it's time for me to eat my words (which, thankfully, contain far fewer calories than a pork pie) because though I'm not going to Rio (yet), I am going somewhere even more foreign and challenging: Russia! Yep, I've signed a contract for 9 months working on the Winter Olympic Ceremonies in Sochi, Russia. If all goes well with the visa paperwork, I'll be starting in Moscow around June 15, which is ridiculously soon, and slightly terrifying. Then again, I've been waiting for the aforementioned visa paperwork for three weeks now, so June 15 may come and go with me still lounging in Brixton. What made me change my mind about working in foreign lands? Well, mostly it's that I know I want to work on more ceremonies, and I found out that lots of the good people I worked with on the London Games have moved on to Sochi, including some I worked very closely with. And the money is really good, and it's only 9 months. So why not? Who knows when I'll be in a position to do this kind of thing again? Right now I'm kind of "in the club" of ceremonies technical people, so I might as well stick with it while I can. So stay tuned for the usual London stuff for a while, and then standby for a temporary re-branding of the blog, and the now-familiar long break in blogging leading up the the opening ceremony day on February 7, 2014. And wish me luck!